Japan is one of the most amazing, beautiful, and friendly countries in the world. From bustling Tokyo and zen-like Kyoto all the way to laid-back Okinawa and wintery Hokkaido, Japan is a high-tech world mixed with the politeness and respect of their past. Honestly, I love traveling and backpacking Japan. It was a life-long dream to go there and, when I finally did, it lived up to all my expectations. 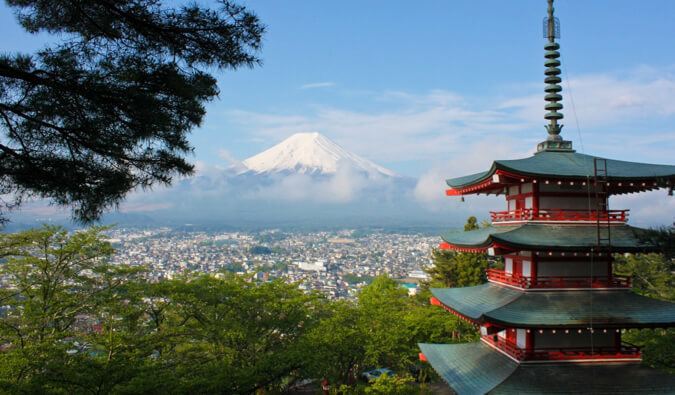 Japan has mouth-watering food, majestic temples and shrines, zen gardens, lush national parks, and a rich historic culture. It’s a wonderful place and, while it may be an expensive country to visit, there are plenty of ways to make this country an affordable place to visit. I was actually shocked how easy it was to travel Japan on a budget! 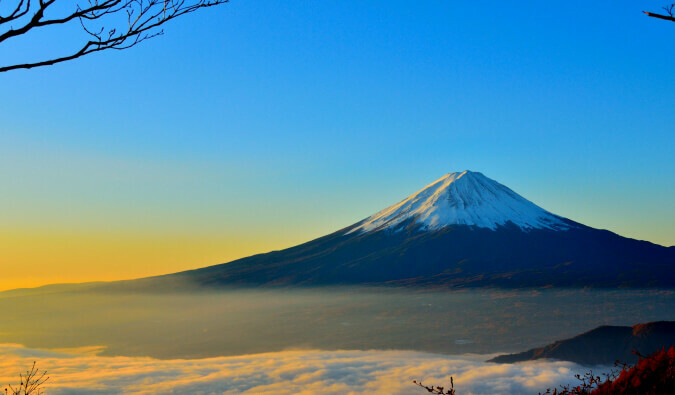 Backpacking or traveling Japan isn’t as expensive or difficult as you think. It’s one of those great myths of travel that Japan has to be expensive or hard to get around. And everyone here is super friendly and helpful. Everyone here is just so excited to have guests and are lovely, lovely people! Let this Japan travel guide help you plan an affordable trip to the country so you can see more, eat more, and spend less – whether you’re backpacking the country or just on a short holiday and looking to save money! Tokyo is one of the best places in the world: shrines, palaces, temples, cherry, hip clubs, bars, people, and fashion stores – Tokyo is a fast placed, futuristic city. Don’t rush it! It’s everything you expect and more! 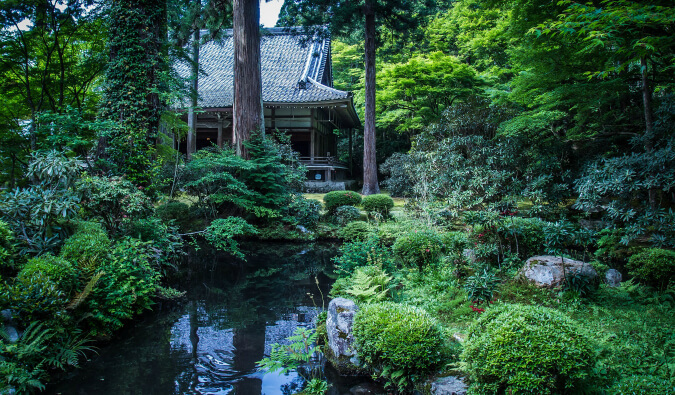 The city of beautiful temples and Japanese gardens, Kyoto is one of the top destinations in Japan. 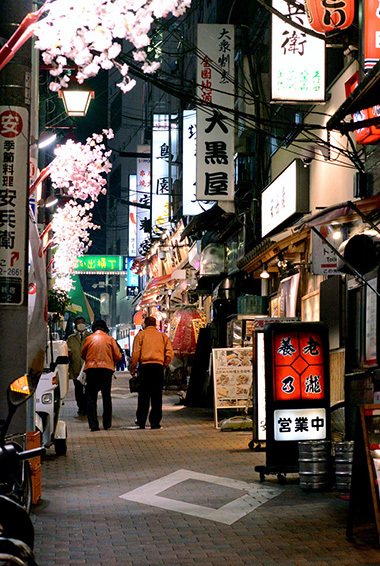 It retains much of the traditional Japanese lifestyle and is a good juxtaposition to fast-paced and high-tech Tokyo. By far my favorite place in the country, see as many temples as possible and don’t skip the epic bamboo forest! 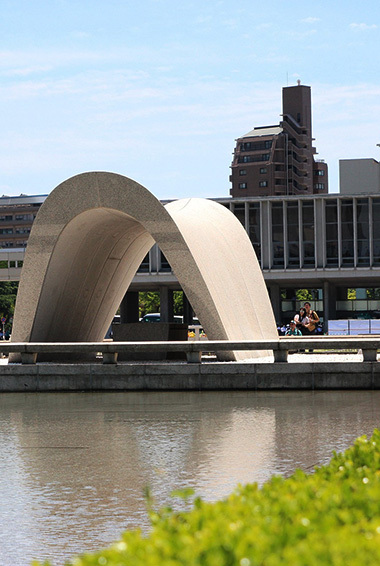 Visit the bomb memorial and learn about one of the most controversial events of human history – the dropping of the nuclear bomb on Hiroshima. It’s a tragic past but seeing how the city has thrived gives you hope for the future. This 3776m foot tall mountain is located near Tokyo, and it makes for a worthy climb. During the day it is often covered in fog and clouds so ascents tend to happen early in the morning or overnight. The lack of sleep is worth the jaw-dropping sunrise. 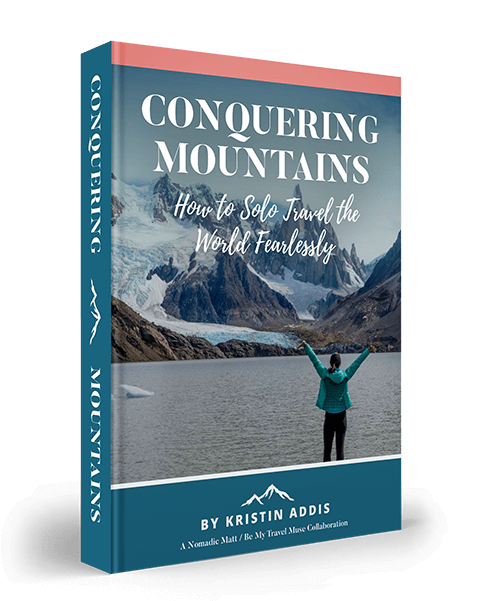 Keep in mind the climbing season is short, from early in July to mid-September. The gateway to Japan’s northern island of Hokkaido, this city is famous for its surrounding mountains, thermal baths, and ski resorts. Hugely popular in the winter for its winter games, be sure to check our nearby Otaru for uni, squid, and famous seafood! Tokyo’s fish market. This market starts bright and early at 4am and you can see the frenzied buying and selling of the world’s largest tuna market. 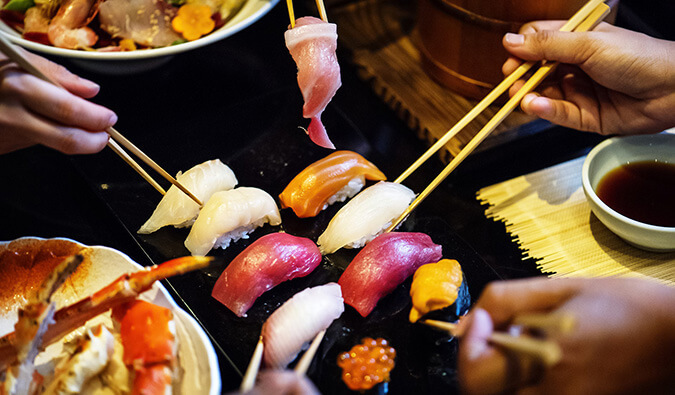 Eat just-caught sushi for breakfast and marvel at the frenzied atmosphere. There’s nothing like it in the world, so this a must-see while you’re visiting Japan! As of 2018, the inner fish market moved to Toyosu and is now known as the Toyosu Fish Market, however, the outer market (where you can find food and shops) is still in place. Otherwise known as the Geisha District, you can spend the day here for as much, or as little, as you’d like to spend. The area is filled with fascinating architecture and if you’re lucky you may be able to spot a geisha (a traditional professional entertainer). It’s also a good area for window shopping. For the ladies, the Gion District also offers pseudo-apprentice geisha treatments. You can go and have full make-up done and try on a formal kimono. Photos afterward make for an awesome souvenir—and you can even have stickers made. This is probably the most exciting way to learn about the ancient geisha tradition. The Heian Shrine is a popular tourist attraction so get there early if at all possible. The garden is filled with beautiful cherry blossom trees, known as sakura, and a beautiful place for some pictures. The shrine is free but the garden nearby costs 600 JPY (5 USD) to enter. To see the trees in blossom, make sure you’re there mid-April. Ueno Park is a great place to spend the day and for free. Take your camera as it’s a perfect spot to record the many cherry blossom trees, and take a lunch too to save some extra money. Visit the Imperial Palace which is home to the Emperor of Japan and a perfect opportunity to learn about some of Japan’s history and culture. Though you can’t go inside, the surrounding grounds and park are beautiful and you can see the changing of the guard. Be sure to visit this “shrine island” for all its scenic beauty. It can easily be made into a full day’s trip with the walking trails nearby. One-way tickets (including the ferry) to get you there will cost about 180 JPY (2 USD). Be sure to hike up Mount Misen – it’s a great workout and the views are stunning! The entrance fee for this ancient castle is 300 JPY (3 USD) and it’s well worth it. See for yourself the only original, still-standing castle in Japan. It’s the country’s highest castle as well, located 430m above sea level. The 88 Temple Pilgrimage is an ancient pilgrimage route that circles the island of Shikoku. The route is over 1,200 kilometers and can take between 30 and 60 days. You can, of course, just visit some of the temples and not walk the entire trail! A little off the beaten path, there are great temples and shrines in the woods, and the woods themselves make for excellent hiking and meditating. Nikko is worth a day or two of your time! Located in Osaka, this 17-minute ride offers sweeping views of Osaka Bay and the surrounding area. Between 1997-1999, it was the world’s tallest Ferris Wheel, but it has since been outranked. It also happens to be next door to one of the largest aquariums in the world, the Osaka Aquarium Kaiyukan. There are plenty of temples and monasteries in Japan that host daily meditations, some of which even offer accommodation and allow tourists to sample monastic life. It’s a really eye-opening experience. Feeling stressed or do you just want to chill out? Give it a try! A ryokan is a traditional Japanese bed and breakfast, usually found in the more scenic regions of the country. With their tatami floors and cozy interiors, ryokans make for an intimate and unique Japanese experience. Meals are usually included, as are the traditional Japanese robes and slippers you’ll wear during your stay. Also known as jigoku, this is a collection of natural, geothermal hot springs—located in Beppu. Each pool is a quasi-amusement park, with a unique theme. The purchase of a coupon grants access to nearly all of the pools. You can’t get in the water, but this is an awesome photo opportunity. Natural hot springs are widespread throughout the country, and can be found both indoors and outdoors. Each has different mineral compositions and are a great way to soak in some traditional Japanese culture. If you make it all the way up to Hokkaido, be sure to spend some time exploring Daisetsuzan National Park. The park offers numerous trails, and some of the most rugged and beautiful landscapes in the entire country. It’s a far cry from the tourist trail, so you’ll get to enjoy some rare peace and quiet. If you need a break from the fast-paced life of Japan, hop down to Okinawa. Considered the “Hawaii of Japan”, life proceeds at a much slower pace here. The climate is subtropical, and there are numerous nearby islands to explore. If you are looking for a great hike in Kyoto, this is a hill that offers a bit of a challenge and an interesting attraction at the top. Beyond the panoramic views of Kyoto, this is an awesome place to see wild monkeys and get some fun souvenir photos. Adult admission is 550 JPY (5 USD). Accommodation – Most hostels will charge between 2,500-4,000 JPY (20-35 USD) per night for a dorm room. Capsule hotels cost between 3,000-5,500 JPY (25-50 USD) for a tiny little room (that’s really a pod). If you’re looking for privacy, expect to pay around 8,500 JPY (75 USD) for a double room at a budget hotel. The price of accommodation in the big cities is significantly higher than if you were to travel off the beaten path (Okinawa, for example, is half the price of Tokyo). A private apartment/home usually goes for 8,800 JPY (75 USD). If you are looking for a more unique experience, consider staying at a ryokan, a traditional Japanese bed and breakfast. While they will be more expensive than a standard hotel, it will be a unique and memorable experience as you’ll get to sleep on tatami mats, traditional breakfasts, and more! Food – There are many cheap places to eat out in Japan from the ramen noodle shops to miso and soba noodles. These food options range from 250-1,250 JPY (2-11 USD). Buying groceries will cost you 3,700-5,000 JPY (35-45 USD) per week. Most restaurant meals cost around 2,000 JPY (20 USD). Mid-range restaurants can cost around 4,350 JPY (40 USD). Sushi trains cost between 125-620 JPY (1-6 USD) per piece. Fast food is around 800 JPY (7 USD). Transportation – Transportation in Japan is incredibly expensive. Trains are the most convenient, but also the most expensive, way to travel. A train ticket from Osaka to Tokyo can cost around 20,000 JPY (165 USD)! Most of the city metro tickets cost 125-250 JPY (1-2 USD) for a single journey. In most major cities, you can buy a day pass, which gives you unlimited travel for 24 hours for around 600-800 JPY (5-7 USD) on select trains and buses. Inter-city bus tickets cost around 2,500 JPY (20 USD). Consider purchasing a Japan Rail Pass if you will be riding a lot of trains. JR passes come as 1, 2, or 3-week passes and give you free travel on JR lines. If you plan to do a whirlwind trip, this is the best way to save some money. You can now purchase a Japan Rail Pass in Japan. Though, the pass can be up to 20% cheaper to buy online before you arrive. If you are feeling adventurous, you can also hitchhike. While almost no Japanese hitch hike, many are more than happy to pick up foreigners. 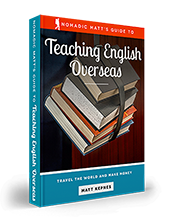 It’s a chance for them to practice their English and engage a new culture, so don’t be afraid to stick out a thumb! Activities – Most temples and museums are free to enter, although some popular attractions cost around 1,250 JPY (10 USD). 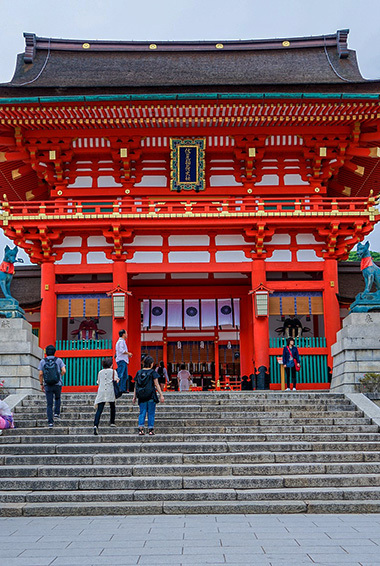 The temples in Kyoto can cost up to 620 JPY (5 USD). Many of the city’s parks are free, so take advantage when you can and spend the day there. You can buy city or temple passes that are valid for one day. Japan can be an expensive place to visit. If you’re backpacking Japan, plan to budget between 8,000-9,000 JPY / $65-75 USD per day. This is a suggested budget assuming you’re staying in a hoste dorm (or couchsurfing) cooking some of your meals, eating at the cheap 100 yen or to go shop donburi shops, visiting free museums and temples, and using local transportation. Keep in mind if you are taking the high speed train, you’re budget will likely be closer to $75-85 per day. On a more mid-range budget of 12,000 JPY / $100 USD per day, you can stay in nicer accommodations and private rooms, eat out more liberally, indulge in more drinks, visit more attractions, and, overall, just have some more breathing room in your travels! On 22,568 JPY / $200 USD per day, you can stay in traditional Japanese accommodations or hotels, eat at very nice restaurant each day, splurge on some really high-end places, enjoy drinks as often as you want, take tours, fly, and, overall, just afford whatever you want when you visit Japan! 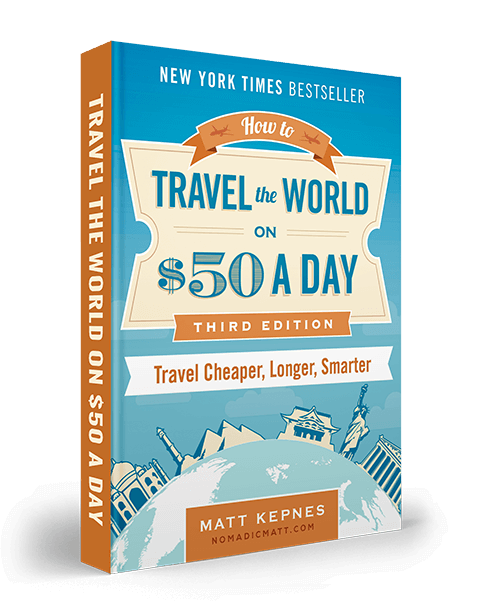 If you’re staying in international hotels, I’d add another $50-100 a day to your budget. This chart can give you an average breakdown of your expenses. Remember these are only guidelines. How you budget your money in Japan based on your own desires and logistics will determine how your budget will really come together! 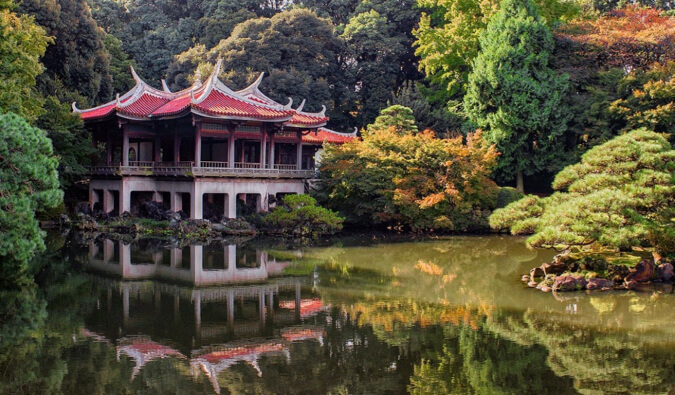 Visit the free attractions – With countless museums, shrines, temples, historic neighborhoods and parks, Japan is filled with opportunities to become immersed in its culture. Many of the nation’s parks and museums are free. Get a JR Pass – The bullet trains in Japan are ridiculously expensive with one-way fares costing hundreds of dollars. If you plan to do a lot of travel around the country, get the JR Pass which allows you unlimited train travel and will save you a ton of money. It comes in 7, 14, and 21-day tickets. Keep it mind it can only be purchased outside of the country, so be sure to plan ahead! Take the bus – Buses are a far more economical option than the trains. They cost a fraction of the price but take a lot longer. For example, the two-hour bullet train ride from Tokyo to Osaka becomes a 10-hour bus ride. You can get unlimited Japan rail passes for 29,100 JPY (255 USD), for 7 consecutive days of travel, but this is far more expensive than using the bus. Bottom line: if you have the time, take the bus. Shop at the 100 Yen (1 USD) stores – There are many 100 Yen shops in Japan with set meals, groceries, water bottles, toiletries, and household items. Store names vary by region, so ask your hotel/hostel reception where the nearest one is located. Eat at 7-Eleven – A 7-Eleven, Family Mart, and other convenience stores have a lot of pre-set meals (including sandwiches, soups, fruit, and more traditional Japanese options) for 125-370 JPY (1-3 USD) that make for a cheap lunch option. Additionally, supermarkets also have many set meals at similar prices. Cook your food – Hostels have kitchens where you can cook and cut your food expenses to less than 745 JPY (7 USD) per day. Combining this with shopping at the 100 Yen stores will drastically cut your food costs. Eat curry, ramen, and donburi – I essentially lived off these three foods during my three weeks in Japan. Curry bowls were as cheap as 370 JPY (3 USD) per plate. Donburi, bowls of meat and rice, are around 500-620 JPY (5-6 USD). Ramen is never more than 870 JPY (8 USD). These are the best ways to eat cheap, filling meals while in Japan. Work for your room – Hostels in Japan often let you work for your room. You’ll spend a few hours in the morning cleaning and you’ll get free accommodation for as long as they’ll let you stay. This is a great way to save money if you want to stay in the same area for a while. Couchsurf – Using hospitality sites like Couchsurfing that allow you to stay with locals not only gets you a free place to stay but lets you interact and learn about local life. Make sure you ask early – the response rate is not very good! Buy food at night – After 8pm, supermarkets discount their fresh food as they have to get rid of it (by law). If you buy your food after 8pm, you can save up to 50% on almost everything fresh. Hitchhike – Japan is one of the world’s safest countries, and many locals are curious enough to pick up foreign visitors. Hitchhiking isn’t really practiced by the locals, so you will stand out as a tourist which will increase your chances of finding a ride. Getting around Japan is incredibly easy, although not usually cheap. But there are ways to save money. Metro – Most of the city metro tickets cost 100–200 JPY (1-2 USD) for a single journey. (The price varies by distance and may often be higher.) Fares were usually around 220 JPY (2 USD) to travel across Tokyo but less for shorter distances. In most major cities, you can buy a day pass, which gives you unlimited travel for 24 hours for around 800 JPY (7 USD). Trains – The bullet train is awesome, comfortable, and super fast – but it’s not cheap. Individual tickets can cost hundreds of dollars. In order to reduce your train costs, get a Japan Rail (JR) pass. The pass is indispensable for travel in Japan. These passes cost 29,110 JPY (255 USD) for 7 days, 46,390 JPY (410 USD) for 14 days, and 59,350 JPY (550 USD) for 21 days. All pass times are for consecutive travel. Even if you just get the seven-day pass, it’s the same price as a round-trip train ticket from Osaka to Tokyo (14,250 JPY / 125 USD each way!). Moreover, these JR trains also serve local city areas and so can be used intra-city. I used my pass to get around Kyoto and Tokyo instead of buying metro tickets. So even if you aren’t going to do much travel around Japan, buying a pass is better than buying individual tickets. While the high price of the pass can cause sticker shock, the alternative is even worse. Though the pass can be up to 20% cheaper to buy online before you arrive, you can now purchase a Japan Rail Pass in Japan. 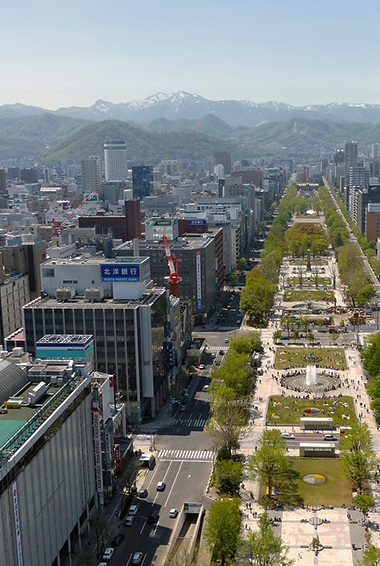 Passes are available in the following country locations: Sapporo, Sendai, Niigata, Tokyo, Shinjuku, Yokohama, Nagoya, Osaka, Hiroshima, Takamatsu, Hakata, New Chitose Airport, Narita Airport, Haneda Airport, and Kansai Airport. Flights – In general, their prices are on par with bullet train tickets. ANA also offers a special last-minute 11,284 JPY (100 USD) fares via a hidden page on their website. It’s only available to foreigners and can sometimes be cheaper than the flights you find on Skyscanner, especially for longer routes around the country. 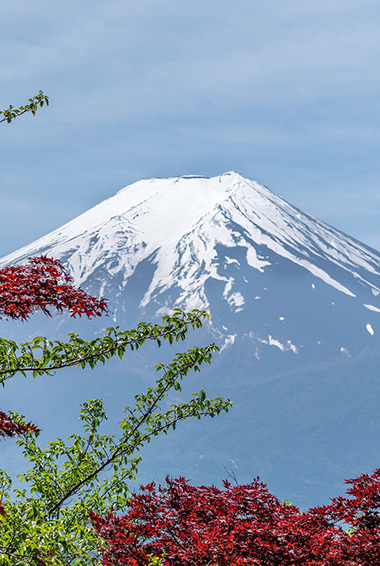 Temperature and weather varies drastically across Japan, meaning it’s always a good time to visit various parts of the country – just at different times. While most of Japan does have four seasons (including snowy, freezing winters in Northern Japan), Okinawa and the islands in the south are warm year-round. It gets cold in Tokyo, but it generally doesn’t snow. Japan also gets a lot of rain and humidity, mostly in the summer months from mid June to mid July. It gets a little drier in August before picking up again in September. Then, of course, there’s the threat of typhoons. Typhoon season occurs from May to October. Japan is well-equipped to handle all types of typhoons, but be sure to purchase travel insurance in advance! The driest months in Japan are from December-February, but you should prepare for rainy weather year-round. Packing an umbrella or raincoat is key. There’s no real bad time to visit – winter is awesome for skiers or snowboarders, spring is famous for its cherry blossoms, summer is full of festivals, and fall has brilliant autumn colors and nice temperatures. Peak season is definitely when the cherry blossoms are at their finest (from mid-March to mid-April). Be prepared for huge crowds during this time. Japan is a notoriously safe country. There’s zero chance you’re going to get robbed, scammed, or hurt. None. Zero. You’re going to be super duper safe. As a solo female traveler, you do have to watch out for lude behavior. Some female travelers have reported inappropriate behavior, like men asking personal questions or catcalling, and groping on trains. Most train companies now have “women only” cars during rush hour – you’ll see pink signs directing where women should board. Japan’s emergency number is 110, or you can call the Japan Helpline at 0570-000-911. If you don’t do it at home, don’t do it here! Agoda – Other than Hostelworld an Airbnb, Agoda is the best hotel accommodation site for Asia. Intrepid Travel – If you want to do a group tour around Southern Asia, go with Intrepid Travel. They offer good small group tours that use local operators and leave a small environmental footprint. If you go on a tour with anyone, go with them. And, as a reader of this site, you’ll get exclusive discounts when you click the link! The Man in Seat 61 – This website is the ultimate guide to train travel anywhere in the world. It has the most comprehensive information on routes, times, prices, and train conditions. 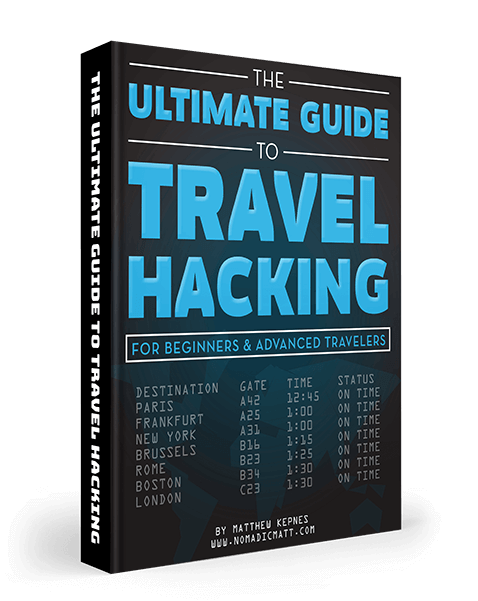 If you are planning a long train journey or an epic train trip, consult this site. If you’re heading to Japan, knowing what to pack and the kind of backpack to get can be a little daunting. In this section, I’ll give you my suggestion for the best travel backpack and tips on what to pack. 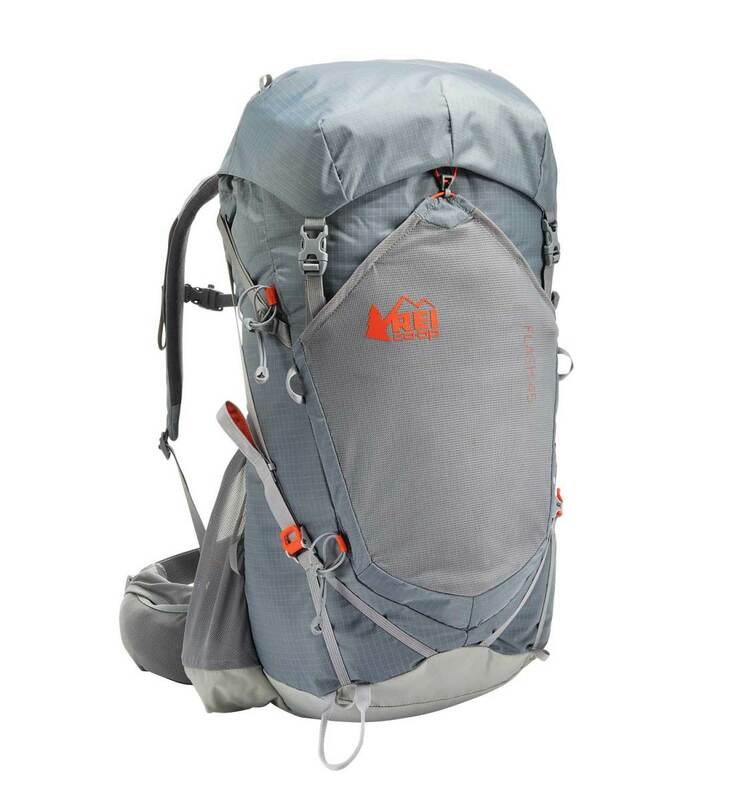 For a great backpacking for Japan, I recommend the REI Flash 45 Pack. It’s light and comfy, front loading, and fits perfectly in an airplane’s overhead bin. If you want something different, refer to my article on how to choose the best travel backpack for more tips and tricks on how to get the right pack. 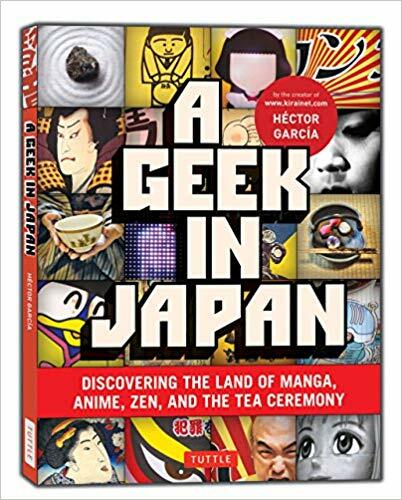 If you’re a geek for manga, anime, zen, or J-pop, this book is for you. Even if you’re not a geek for those things, this book is a worthy read! It’s smart and easy to understand, and will give you lots of insight into Japanese pop culture and society. It’s easy to read too, with short articles complete with sidebars and plenty of photography. If you grew up with Pokemon and manga, give this a read. 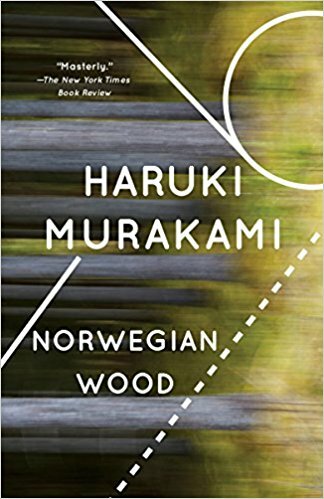 Norwegian Wood is the book that made Haruki Murakami a literary icon. This is the story of Toru, a young college student in Tokyo who is devoted to Naoko, a beautiful and quirky young woman. Their passion for one another is interrupted by the death of their best friend from years before, and as Naoko retreats into herself, Toru finds himself wandering into the arms of another young woman. You’ll want to take your time reading this book – the prose is poetic and beautiful, and the kind of read that’s supposed to be absorbed slowly. 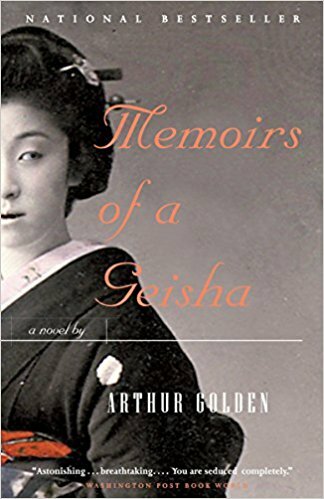 Memoirs of a Geisha is an easy read, although not particularly a light one – but it offers an inside look at the life of one of Japan’s geishas. In 1929, when Nitta Sayuri is nine years old, she is sold into slavery at a geisha house. This story follows her journey as she learns how to become a geisha, from the art of wearing a kimono to the very precise way of pouring sake. Even applying make-up is a tedious art form. You won’t be able to put this book down! Will Ferguson is like the Canadian version of Bill Bryson – he’s hilarious and self-deprecating, but smart and with a knack for storytelling. 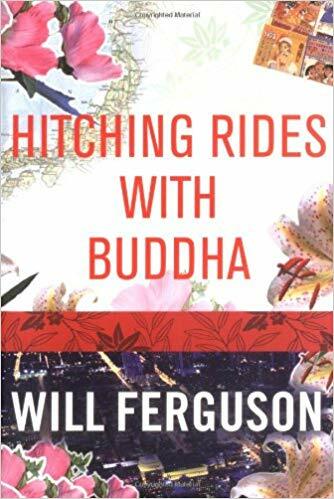 In this book, Ferguson finds himself hitchhiking through the length of Japan, hopping into cars with strangers and sometimes even making himself an overnight guest. You’ll laugh out loud at Ferguson’s warm and engaging stories as he drinks too much sake and fumbles his way along the Cherry Blossom Front. It’ll spark some serious wanderlust! 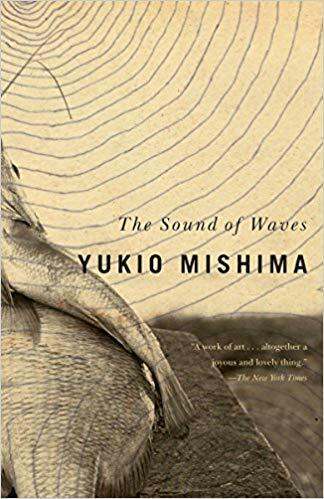 A Japanese classic, The Sound of Waves is set in a remote fishing village in Japan, and it’s the story of a first love. Here, a young fisherman falls for the beautiful daughter of the wealthiest man in town – and, much to his surprise, the feeling is mutual. The couple must deal with the gossip and scandal of their fellow villagers as a result. Mishima’s writing is beautiful and thought provoking.